Annie lost her battle with Congestive Heart Failure today (5/4/06) @ 11:30 AM EDT. 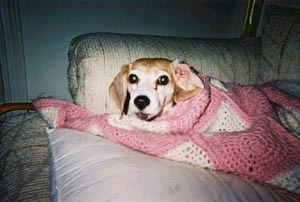 I let her go to the Rainbow Bridge wrapped in her little pink blanket. The choice was not mine, she let me know. Farewell my brave little beagle girl. If Love alone could have kept you on this earth you would never leave. So I was sure you'd understand. At that near or distant time.